This condition usually affects fair-skinned people. 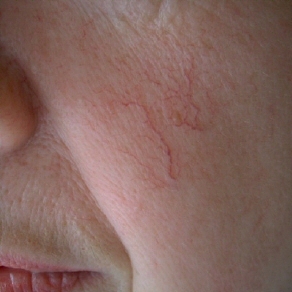 The capillaries beneath the skin are easy to see and the condition occurs due to the stretching of the tiniest veins in the face. The walls of the capillaries are usually very elastic and can dilate when there is a stimuli such as spicy foods, alcohol, hot drinks and other triggers. So when this happens the person looks flushed. But once the triggers are taken out of the situation and the effect wears off the capillaries should return to their original size. So, if the capillary walls lost their elasticity due to the bad diet, sever climates, circulatory disorders they may not shrink back as they should and cheeks will appear red all the time. So, how can essential oils help? They can help restore some elasticity to the blood vessels and eventually reduce or get rid of redness. However the treatment has to be very regular and carried out on daily basis. Usually some results are noticeable after few weeks of treatment, but real results will be achieved only after 4 to 6 months of daily use. Gentle facial massage with essential oils of roman chamomile, parsley, rose otto, cypress and neroli are the key oils to your success. Best carrier oils for this are calendula infused oils and unrefined avocado oil. Also a good oil is Arnica infused carrier oils, cause Arnica is known for strengthening the tiny vessels. Formulation: essential oils total 10 to 25 drops per 1oz of carrier oil, depending on your tolerance. Key oils to use chamomile, rose, parsley and then choose between cypress, or neroli or geranium. Use in gentle facial massage once a day and also use as a moisturizer on regular basis. During the treatment diet must be improved and alcohol, coffee, hot tea, extreme weather conditions have to be kept to a minimum. Do not wash face in hot water, facial steaming and sauna – are all a NO. I am 35 years old and my red capillary face is getting worse. this condition of broken capillaries, requires long term treatment and can improve with time, and oils such as geranium, cypress, parsley and german chamomile and carrot can be of assistance and will be helpful with continuous use. Is that a before picture? Your asuuring after 6 months of sticking to the routine of using the specific oils those tiny veins are 100% gone? I live in a very hot and sunny country and have afew visible blood vessals on my face. I want to try this treatment but afraid the combination of the essential oils and sun will stain my face. Hello, yes it is not a good idea, since there are citrus oils in there. Then don’t use the citrus oils and the other oils will be enough won’t they? Don’t use the citrus oils, the others will be enough and the sun won’t hurt you.